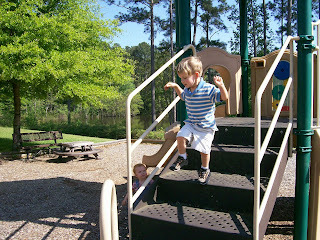 A few pictures of Dawson playing at the church playground during our recent MOPS (Mothers of Preschoolers) picnic. Throwing his ball down the steps. 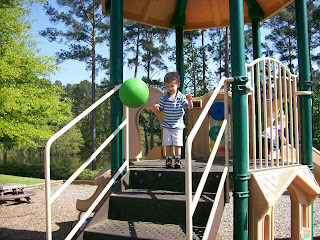 He found it endlessly entertaining to watch the ball bounce down the steps. After the ball bounced down the steps, Dawson would do the same. 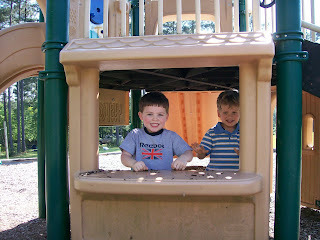 Dawson and Eli playing in the little house under the playground. They were pretending to have a party or bake a cake or something. They both have great imaginations so it's always neat to hear what's going on in that imaginary world of theirs.